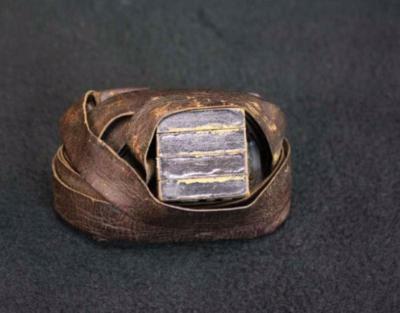 Tefillin (Phylacteries) are two black leather boxes fastened to leather straps, containing four portions of the Pentateuch written on parchment (Exod. 13:1-16; Deut. 6:4-9; 11:13-21. They are bound (“laid”) on the arm…. They are laid by adult male Jews on weekdays but not on Sabbaths and festivals (customs differ as to the intermediate days of festivals). Originally worn all day, they are now donned only during the morning prayer (on Av 9, during the afternoon prayer).